When business telephone systems begin to reach the four or five-year mark, it usually means it is time to have a rethink, a refresh or an upgrade. You may experience resistance from your finance director, but it could cost much more in the long term should your system begin to fail. To an extent, we can all feel a little resistant and wonder why we are compelled to make changes when what we already have is not broken. To this argument, I always apply the ‘TV theory’. A friend of mine has an old-old style TV. By old-old, I mean it still has a sizeable backend to it and its picture and sound quality is rather poor. I have an old TV. It has a kind of flat screen, it certainly isn’t smart and there’s not a curve in sight. Both work, but they are not as good as the latest models. We are both missing out on the quality and applications now available with newer models. Technology is constantly evolving and what we bought 15, 10 or even five years ago will not be as good as what is available now...and that includes your telephone system. Whereas not replacing my old TV means I could lose out in my recreational time, hanging onto an older telephone system means you could be damaging your business. 1. Are you confident you answer all your calls? 2. Do you know how long you take to answer a call? 3. Are you aware if any calls have been lost? 4. How successful are your marketing campaigns? These are fairly big hitting questions! Unsure? 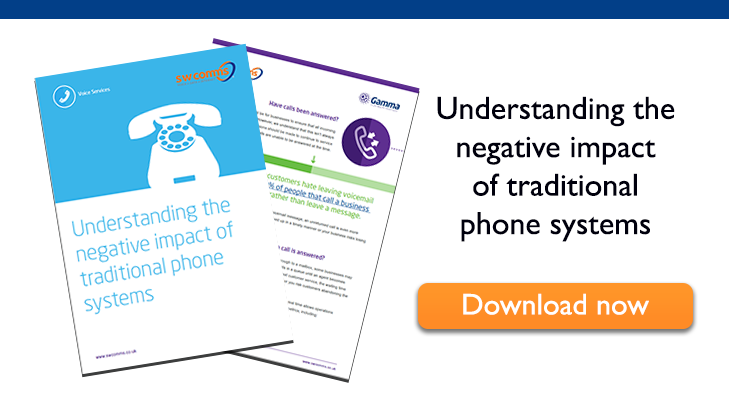 Take a look at our free, short and sweet guide on Understanding the negative impact of traditional phone systems.